After seeing off one local team in the quarterfinals, East Bengal run into Indonesian League champions Petrokimia Putra in the semifinals of the inaugural ASEAN Club football championship here tomorrow. In an apparent bid to punish the sponsors whose damage claims are likely to deprive the cricket board of its World Cup profits, the BCCI today indicated that it might not consider these companies while awarding sponsorship rights for international matches in the country in future. Jacques Kallis’ absence from the first Test against England, which gets underway at Edgbaston here tomorrow, has left South Africa with a huge hole in their team. There is perhaps no position more wretched in sport than that of 12th man. First comes that sense of rejection as the coach reads out the team, a heavy punch to the solar plexus which must be immediately masked by a genuine-as-possible smile and hearty congratulations to the preferred few. 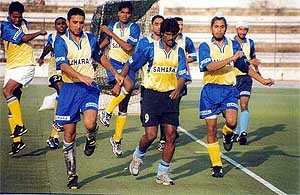 The Indian hockey team training here for the six-nation Champions Trophy is evolving a new strategy. Asia’s No 1 golfer Jyoti Randhawa was off to a flying start in the Indian PGA Tour, sharing the top spot with Arjun Singh at the Rs 18-lakh season-opening Kashmir Open Golf Championship after the first round here today. Michael Phelps of the US in action in the 200-metre butterfly semifinal event at the 10th World Swimming championships in Barcelona on Tuesday. 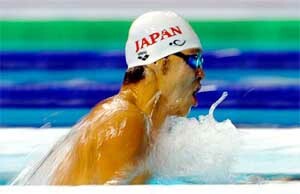 Phelps set a world record by timing 1:53:93. 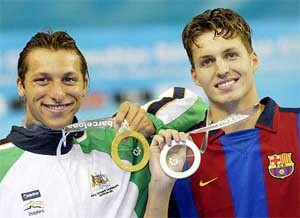 Australia's Ian Thorpe (R), gold medallist in the men's 200 metre freestyle event, shows his medal alongside silver medallist Pieter van den Hoogenband of the Netherlands, at the 10th World Swimming championships in Barcelona on Tuesday. Michael Phelps said comments from Australia’s former head coach downplaying his achievements had helped spur him to a superb world record in the 200 metres butterfly today. Olympic champion Pieter van den Hoogenband bounced back from yesterday’s comprehensive defeat by Ian Thorpe to set the fastest heat time in the 100 metres freestyle at the world swimming championships today. Richa Mishra broke a long- standing national record in women’s 200m butterfly event at the World Swimming Championship in Barcelona today but once again the gulf between India’s best and the top performers lay exposed. In a complaint to the Additional Director General of Police and Chief Director, Vigilance, former Director (Sports), Guru Nanak Dev University, Dr Kanwaljit Singh has asked to take action against Bhupinderpal Kaur, a volleyball coach who had illegally claimed house rent allowance (HRA) for nearly two decades amounting to lakhs of rupees. Kiwi Boys beat Eleven Present by 138 runs in Minjar Fair Cricket Tournament here. Kiwi Boys won the toss and elected to bat. The highlights of the match were 60 runs by Tonu, 45 by Ranji player Ajay Mannu and 46 by Parshant. Kiwi Boys scored 208 for 3 in 20 overs. Rajni Malhotra, a student of B.A. III of R.R. Bawa D.A.V. College for Girls, here returned today after winning a gold, a silver and a bronze medal in the 12th World Yoga Competition in Portugal. 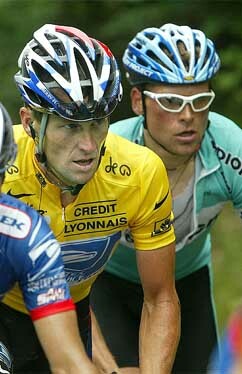 US Postal Service team rider Lance Armstrong rides alongside Bianchi team rider Jan Ullrich of Germany during the 197.5 km 16th stage of the Tour de France cycling race between Pau and Bayonne on Wednesday. Armstrong holds the overall race leader’s yellow jersey while team-mate Tyler Hamilton won the stage. 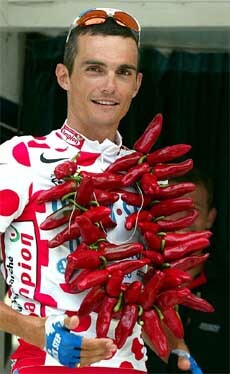 Quick Step's French rider Richard Virenque wears a garland of red chilies, given to him by local producers, before the start of the 197.5 km 16th stage of the Tour de France cycling race between Pau and Bayonne on Wednesday. A win would see the red and yellow brigade create history as the first Indian club to make it to the final of an Asian- level tournament. A quarterfinal league appearance in the Asian Club Championships in 1985 was East Bengal’s best show till now. It would be a close contest between the National Football League champions from Kolkata and Putra, who came back from two goals down to beat SAFFC of Singapore via the golden goal in the quarterfinals. The guest side in the tournament, who stunned Persita Tangerang in the last eight round, would however kick-off with a slight edge against Putra. The locals will have plenty of support but they will also be under pressure to perform on their home turf. Assured of $ 10,000 irrespective of tomorrow’s result, East Bengal’s campaign will become more lucrative with another win as the champions will take home a purse of $ 50,000 and the runners-up $ 30,000. The third place winner will get $ 20,000. East Bengal coach Subash Bhowmick will be hoping that his players will carry on their good work, especially the star cast. Baichung Bhutia has been in great form and the Sikkimese, who feels that this tournament will be a test for Indian football, leads the goal scorer’s chart with six strikes, five of which came against Army FC, the Philippines. His nearest challenger is Terdsak Chaiman of BEC Tero Sasana, Thailand with three gaols. With Brazilian Douglas De Silva marshalling the midfield and skipper Suley Musah showing the power and stamina of the African continent, East Bengal will be ruing the injury to another key player Mike Okorro who is still recuperating. It remains to be seen whether Bhowmick will field him in tomorrow’s match. Sandip Nandy has shown a lot of promise with his goalkeeping in this tournament which has prolonged the comeback bid of main ‘keeper Sangram Mukherjee. The defence almost measured up to the challenge in the opening match defeat against the Thai champions but since then held its own despite some disputable refereeing decisions that went against them. With key player Debjit Ghosh ruled out with injury following a freak collision in the quarterfinal match, East Bengal would start with both Bijen Singh and Shylo Malsawmtluanga who took turns to play in the earlier matches. Putra, on the other hand, showed their mettle coming back to win after trailing by two goals 22nd minutes into their quarterfinal. Clawing their way back, they eventually celebrated after Danili Fernando netted a golden goal in the 113th minute. Indian colts continued their good showing, getting past North Ireland’s leading youth club County Antrium 2-0 in the Milk Cup football tournament at Portstewart yesterday. M. Singh and M. Rahman found the target for the Indians in the well-contested match. BCCI President Jagmohan Dalmiya said the BCCI would be increasingly “cautious” in its dealings with these companies in the aftermath of the contract controversy which saw the World Cup sponsors asking for damages from the Global Cricket Corporation, a move that resulted in India’s guarantee money being withheld by the International Cricket Council. “The board has to be cautious before approaching the companies that failed to support us before and after the World Cup in South Africa because we personally feel that the Indian players’ demands were not wrong,” Dalmiya told reporters after a meeting of the board’s marketing committee here. The lucrative three-year contract for rights of India’s international fixtures at home is up for renewal and the three sponsors — Pepsi, LG and Hero Honda — who had asked for compensation for the breach of contract by the Indian cricketers during the World Cup, might find themselves losing out. “The three-year contract with Pepsi has just ended and we discussed a few companies, though I cannot name the parties as the final decision for the coming years would be taken during the finance committee meeting next month,” Dalmiya said. Asked whether he was in touch with ICC president Ehsan Mani in a bid to resolve the contracts dispute and procure India’s withheld money, Dalmiya said, "Let us not go into that right now as I cannot disclose anything about the issue. But I am sure things would be solved amicably in the near future". Meanwhile, the board was considering the possibility of increasing match fees of both international as well as domestic cricketers. "We have discussed about the possibility of increasing match fees for first class cricketers by 15 per cent and the senior cricketers by 20 per cent, but again everything would be finalised during the finance committee meeting in Kolkata," Dalmiya said. The 27-year-old all-rounder is in Cape Town visiting his cancer-stricken father. Kallis was South Africa’s in-form batsman during the triangular one-day series scoring 329 runs, including back-to-back hundreds, before returning home after the Proteas’ one-sided, seven-wicket final defeat by England at Lord’s on July 12. And without his lively pace bowling, South Africa’s attack - new-ball duo Shaun Pollock and Makhaya Ntini excepted - is vastly inexperienced. All of South Africa’s other top order batsmen made fifties in the tourists’ final warm-up match, against India A, which concluded at Arundel on Monday. Herschelle Gibbs’ innings was especially welcome after a run of low scores. But batting on a placid pitch, against an attack of modest pace, was no preparation for facing England quicks James Anderson and Darren Gough. Whether Gibbs, a gifted strokeplayer, can make the late adjustments that are often required against the swinging and seaming ball remains to be seen. Much will depend on 35-year-left-hander Gary Kirsten, South Africa’s most capped player with 89 Tests, who missed the triangular series after retiring from one-day internationals following the World Cup. England welcome back Test captain Nasser Hussain, who resumes the leadership from one-day skipper Michael Vaughan and wicket-keeper Alec Stewart. Both men, like Kirsten, quit one-day internationals after the World Cup. Surrey stalwart Stewart, 40, announced yesterday he would retire from Test cricket at the end of this series. But he remains a superior batsman to his England rivals. Jacques Kallis’s participation in South Africa’s Test series against England is in doubt after the batsman’s father died today. Kallis had returned to South Africa immediately after the final of the one-day triangular series earlier this month to be with his father Henry, who was suffering from lung cancer. There is perhaps no position more wretched in sport than that of 12th man. First comes that sense of rejection as the coach reads out the team, a heavy punch to the solar plexus which must be immediately masked by a genuine-as-possible smile and hearty congratulations to the preferred few. Isolation follows as you are gently ushered to the periphery of things. Just ask yourself. The team is in deep trouble when the man who deprived you of a starting place steps up, the chance of transforming certain defeat into unlikely victory within his grasp. Where do your loyalties lie now? Or, put another way, who was Nasser Hussain supporting when England met South Africa in their triangular one-day final at the Lord’s earlier this month? Hussain, of course — who remains firmly in charge of the test side against South Africa at Edgbaston on Thursday — was no 12th man. He took the decision himself to stand down as one-day captain and team member after a wretched World Cup. He may have felt, however, that he should jump before he was pushed. Michael Vaughan’s startling success as his limited-overs successor has certainly done Hussain no favours. For not only did new-look England win under Vaughan, but they did so with unexpected style as well as with the biggest of smiles. In effect, their joyous performances perfectly reflected Vaughan the man — open, optimistic, ambitious and hugely talented. His trust in his team-mates — "I said at the start I wanted 11 players thinking and I think I have had 11 out there thinking" — was amply rewarded. Marcus Trescothick and Vikram Solanki scored breathtaking centuries against South Africa, while James Anderson took a hat-trick in the series win over Pakistan. Hussain’s England have similarly mirrored their leader, a figurehead whose lesser natural abilities are bolstered by steely determination and a love of a dog fight. If Vaughan was made for cavalry charges, the respected Hussain, who remains at the helm of the Test side, seems happier deep in the hand-to-hand fighting of the trenches. "Vaughanie is probably more relaxed and chilled out,’’ according to all rounder Andrew Flintoff. "Nasser can be more intense. But I don’t see a problem. They both have immense respect for each other." Hussain’s England have rarely been pretty, but then they could hardly afford to be. When he took over, they were the worst test side in the world and needed a man to kick them into shape. Hussain obliged. Under him, the side hammered the West Indies and ground out rare series victories in the stifling heat and humidity of Sri Lanka and Pakistan. When Australia’s all-conquering captain Steve Waugh — himself under threat from a more colourful and gifted team-mate — suggested that England were boring to watch, Hussain shrugged. He was employed to win battles, after all, not popularity contests. His test achievements have been admirable — to date he needs just three more victories to surpass Peter May’s England record — but there was always going to come a time when more would be demanded. That time may be fast approaching. He could have been speaking for all English fans now thirsting for more panache in the hour of victory. Hussain, hardly an automatic choice as a batsman when compared to his nearest rival, will be under pressure for the first time in years when he runs out at Edgbaston on Thursday. He will be under pressure to make runs. He will be under pressure not just to win but to do so with a flourish. The Indian hockey team training here for the six-nation Champions Trophy is evolving a new strategy especially with an eye on Pakistan. The 24-member probables in their rigorous training session from July 21 were giving attention to skill and strategy. "It would be our effort in the championship to score field goals to the maximum as the team was capable playing the game of skill and power,’’ said the coach Rajendra Singh. Mr Singh, who was the chief coach of the Indian junior side which won the world cup in 2001, said the backbone of the team would be the eight strong players of the junior side who had been elevated in the senior team. "We have evolved a new short corner strategy which will be implemented in the coming tournament,’’ he said adding that under the new formula the players will certainly give a tough time to the opponents in their defence line. He said the Champions trophy was tougher than the Olympics or World Cup as in every match the team had to prove its mettle. “The team members are training themselves to face the challenge from the European team but also from the neighbour — the Pakistan team, which is also preparing in a big way,’’ he added. The team was more attentive in sprucing up their offensive play with players like Dhanraj Pillay, Gagan Ajit Singh, Deepak Thakur, Baljit Singh Saini and Prabhjot Singh taking no chance in mending their lapses. "The offence wing of the team is being further trained to sharpen its attack skills," Rajinder said. The new short corner strategy would certainly yield good results for the team during the coming championship, he added. The team members will play the original Asian style of hockey based on skill but would not ignore the power game played by the European teams. "An India-Pakistan match in any sports discipline always creates tension for both the countries as well as the players, so it would be better to prepare for the historic clash,’’ a player commented. Randhawa played some flawless golf at the picturesque but challenging Royal Springs Golf course to score a five-under 67, the same as Arjun Singh to lead a quality field. Chandigarh’s Ranjit Singh and Delhi’s Pappan were the surprise pair at tied third place, one stroke better than champion golfer for the past four years, Mukesh Kumar, and Uttam Singh Mundy. Among other big names in the field, Vijay Kumar, Shiv Prakash, Sanjay Kumar and Rahul Ganapathy were tied for the ninth place alongwith seven others at one-under 71, while Gaurav Ghei and Sri Lankan sensation Anura Rohana were tied for the 21st place at even-par 72. Randhawa, who started the day from the 10th tee, missed a birdie chance on the opening hole when he three-putted after reaching the par-5 green in two shots. Thereafter the No 1 player in Asia struggled with his new putter, but managed to make four birdies and an eagle on the par-5 seventh. Randhawa sank a 25-footer after hitting a 7-iron to the green on the seventh. He also chipped in for a birdie on the par-3 12th, the most difficult hole on the course. Randhawa said he had problems in adjusting to the conditions here as he had been playing in Japan and most recently at the British Open. “Having played in Japan and the British Open in the past few weeks, I have got used to the speed of the greens there. Also most of the courses have the same bent grass greens, but these are comparatively slower. I could not judge the pace very well today and missed a number of short birdie putts,” Randhawa said. 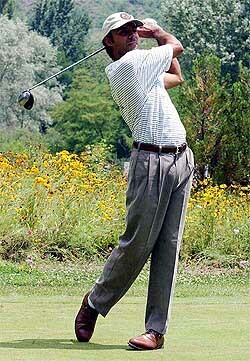 “But 67 is a great start and I hope to capitalise on this,” the lanky golfer said after his round. The 18-year-old American gave notice that he had arrived at the world swimming championships by smashing his own world record by more than half a second with a one minute 53.93 second swim in the semifinals. Former Australian head coach Don Talbot said recently that Phelps, who also holds 200m and 400m individual medley world records, was a great swimmer but still had to prove himself at the top level. The defending champion in the 200m butterfly, Phelps turned at the 100m at 54.89 seconds to lead the field by almost half a second. He stretched out in smooth strokes in the last 50 metres as the crowd at the Palau Sant Jordi pool roared him home well clear of his two-year-old mark of 1:54.58. “I definitely felt good out there,” he said. US team-mate Tom Malchow, who qualified as the joint second fast in 1:55.90, said the Baltimore teenager had unlimited potential. Van den Hoogenband won the final heat in 48.86 seconds, while Thorpe settled for second in his heat behind American Jason Lezak, who returned the second-best aggregate time of 48.93. Thorpe, seventh at the turn in the 50-metre Palau Sant Jordi pool, eased through in 49.17, fourth overall of the 16 qualifiers for the evening’s semifinals from a massive 21 heats. He has so far retained his 400m and 200m freestyle titles to take his record overall world championship gold medal tally to 10. Russia’s Alexander Popov, twice world and twice Olympic champion in the event, showed the fluency of old as he won his heat in 48.94 — third overall. Popov missed the 2001 world championships because of illness but, at 31, looked sharp as ever as he anchored Russia to victory in Sunday’s 4x100m freestyle relay final. Mishra bettered Bula Choudhary’s 17-year-old record by 0.02 seconds, timing 2 minutes 19.58 seconds in the qualifiers, according to information received here today. Dr Kanwaljit Singh claimed that the coach had been indicted in the high-level probe, conducted by a retired judge. The complainant alleged that Bhupinderpal Kaur had been hoodwinking the university authorities by giving a ‘false’ residential address whereas she was staying in the university campus with her brother-in-law, a former Director, Sports. Dr Kanwaljit Singh alleged that despite his repeated reminders, the university authorities did not bother to take action against the coach. Instead, they started discriminating against him, taking away important assignments, he alleged. However, the Vice-Chancellor, Dr S.P. Singh, said action could be taken on the recommendation of the committee, headed by Principal Secretary, Education. When contacted, Bhupinderpal Kaur described the charges as ‘baseless and misleading’. In reply, Eleven Present were all out for 70 runs. Kapoor Singh a Ranji player, got 5 wickets for 6 runs. Brief Scores: Kiwi Boys: 208 for 3 in 20 overs. Tonu 60, Mannu 45, Parshant 46, Amit 35. Eleven Present: 70 all out. Bhanu 20, Kapoor Singh 5 for 6, Mannu 2 for 10. In second match, Pukhri beat Jalpa Club by 9 wickets. Jalpa Club were all out for 60 runs and Pukhri Club overhauled the target losing one wicket. Om Parkash scored 25. In the third match, Titan beat Spirit Fire by 9 wickets in a one-sided match. According to Major S.C. Nayyar, the tournament organiser, about 50 teams are participating in the tournament. She took part in three events, winning gold medal in Olympic Yoga, silver medal in Artistic Pair and bronze medal in Rhythmic Pair. She got training from coach Harpreet Sandhu. She also got one-month training from Naresh Swami in New Delhi. She further thanked Mrs. Veena Watni, Principal, of her college. LONDON: India have moved one step up in the ICC Test rating to replace Sri Lanka at the fifth spot, largely due to the dropping of heavy series defeats to Australia and South Africa from the calculation period. India gained three points to move up in the ranking also because of Sri Lanka’s poor run of results in the last 12 months and a reduction in the significance of its performances in an outstanding 2001-02 season that included nine successive Test victories in the rating calculation. That was the only positional change in the table, according to an ICC release here. Australia continue to lead the ranking with 129 points and are followed by South Africa, New Zealand and England.